What is TRX Suspension Training? MPT and Fitness has it! We have 2 TRX suspension trainers at our facility. You can work out by yourself or share the cost/benefit with a buddy. It doesn’t matter if you’re an Olympic athlete or just venturing into a new hobby of fitness; TRX suspension training is beneficial for all levels of athlete. Just by changing your body position slightly, the load can be increased or decreased on your muscles meaning that everyone can use this method of training. Just two adjustable bands provide a comprehensive workout to every single muscle in your body. You can transport them easily and set up the TRX suspension system anywhere, so when you come back from your healthy holiday, totally addicted, you can buy your own and carry on enjoying the benefits wherever you are. Sometimes the monotony of going to the gym can be tedious, and we can often struggle to keep motivated with our fitness routines. 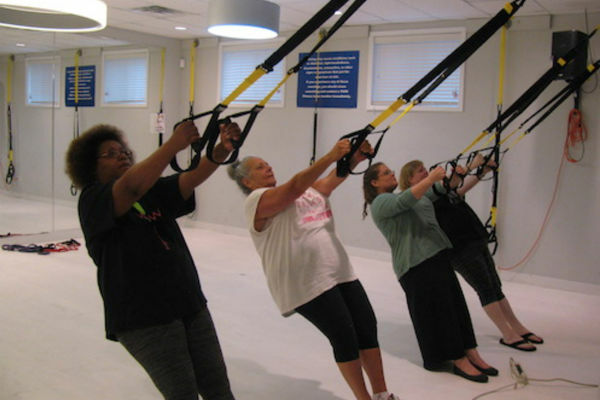 TRX suspension training is unlike any other technique for working out and can be mixed into your normal training to liven it up. This will keep you engaged and looking forward to your sessions time and again.